Jennifer Diane Reitz invented the game of Taasen for her online manga (comic) strip, Unicorn Jelly. I wanted to try out this game, but of course I'm too snooty to just try it out with some cardboard pieces or something. Since I had a big pile of plexiglas scraps lying around from another gameboard project, I figured I could make a decent looking set without much trouble. Since I'd never played the game before and didn't know if it was good or not, I didn't want to make the perfect most beautiful Taasen set ever, but just something that looks OK from a distance. This shows in the way I didn't polish the edges of the pieces, and in the way I constructed the board. The board is put together with hot glue! I know it looks OK in these pictures, but it's pretty cheesy close up. I didn't want to take the time to make accurate recreations of the pieces that JDR uses in her comic, so I just knocked things down to their geometric symbols, since those would be faster to cut. This still took way too much time, but once I'd made the first set I was stuck. The pieces with the triangular tops are the Thaums, the X tops are the Scianes, and the circular tops are on the Paupils. These are stylized versions of the medallion, gear, and sphere tops on the classically-styled pieces shown on JDR's pages. One advantage my set has over the classical pieces is that since the "pushing" cycle is very important for the game, I gave each piece a base that shows which kind of piece it pushes. That is, the Thaums have X-shaped bases, the Scianes have circular bases, and the Paupils have triangular bases. One thing I've noticed is that this kind of kills some of the flavor of the game since players start referring to Scianes as Xs, and Thaums as "X-pushers". Anyway, this was a fun break from the projects that take weeks to complete. I've tried playing the game, too. It's certainly interesting. It seems there's something I'm not getting, because I don't know how to realy go in for the kill. Draws are maybe too common? Luckily for me, I had a bunch of plexiglas scraps lying around that already had 60 degree angles cut into one end. From there, all I had to do was measure in 2 inches from the tip, cut on the band saw, and I had a bunch of triangles. Once I had all my triangles cut and cleaned, I arranged them on my non-stick pad with 1/8 inch gaps between them and filled in the gaps with hot glue. It's not the prettiest thing, but it was very fast. After the glue cooled, I just peeled the board off the pad. 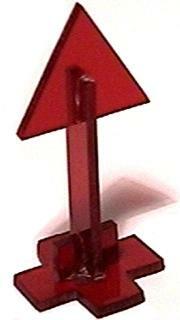 The base is three strips of clear plexiglas glued into a triangle and then glued to the bottom of the board. The pieces took way more time than the board. I had to print out the patterns onto sticker paper, stick the paper onto plexiglas, then cut out the pieces, peel off all the backing and sticker paper, and glue the pieces together. Do not use cyanoacrylate (super) glue on plexiglas. Duco cement works pretty well if you don't have any acrylic adhesive handy (mine was all dried out). The close-up photo to the right shows the cross-piece at the bottom of the vertical, and the way the cross-piece interlocks with the vertical and the vertical with top. I only made one major mistake. I figured that since I used triangles with 2-inch sides to make the board, then 1-inch bottoms would fit well in the board spaces. 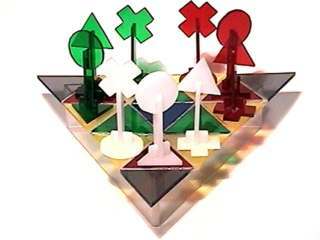 This is true, but at the beginning of the game, all three pieces of each color all have to fit in the same space. They don't quite. Oh well. If I get a chance, I'll make another board with larger spaces and nicer assembly.